…a new report shows that the problems of the EU ETS are systemic and unresolvable. Keeping this failed system in place would further delay real action for reducing emissions in Europe. The report “EU ETS myth busting: why it can’t be reformed and shouldn’t be replicated”, has been published by several signatory organisations from the “Time to scrap the ETS” declaration. It looks at a number of claims made in defence of the EU ETS and shows why they are not valid. Amusingly, for any readers foolish enough to swallow the Liberal Party’s baloney about their “Direct Action” alternative “solution” to the “problem” of man-made climate change, the report calls for … wait for it … direct action alternatives to emissions trading. LABOR will revise down its carbon tax revenue estimates following a crash in the European carbon market, at a likely multi-billion dollar cost to the federal budget. The EU’s carbon price sank to 2.55 euros ($A3.24) in trading overnight, as legislators rejected a proposal to save the market from collapse. The federal budget currently assumes a $29 carbon price in 2015, when Australia’s carbon trading scheme is linked to the EU carbon market. 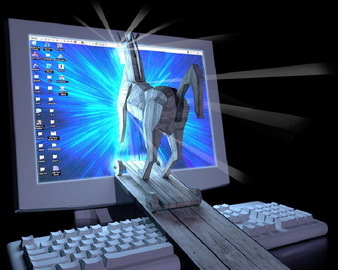 The bankers, speculators, traders, and assorted financial parasites will be pleased. A PROMINENT Australian legal expert says he believes the Gillard government’s carbon tax is unconstitutional and that the three largest states stand a chance of successfully overturning the legislation in the event of a High Court challenge. 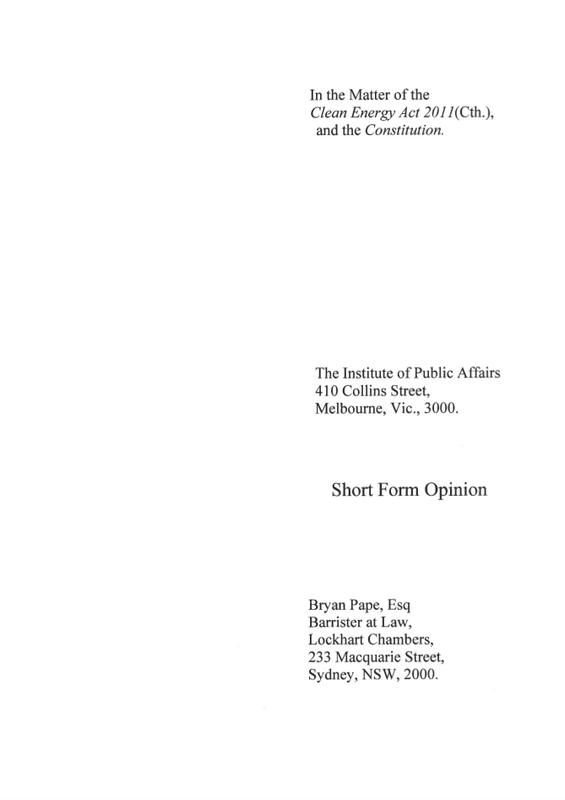 The University of New England academic and practicing barrister, Bryan Pape, has provided legal advice to conservative policy think tank, the Institute of Public Affairs, that says the carbon tax legislation — due to come into effect on July 1 — could be challenged on several grounds including that, ”the Commonwealth cannot tax State property: Legally carbon dioxide emissions are State property”. The advice goes on to say that, in Mr Pape’s legal opinion, ”the Commonwealth cannot impose a carbon tax and other related penalties within the same Act. The Commonwealth cannot introduce a carbon tax within its external affairs powers”. Mr Pape — a specialist in taxation and administrative law — made headlines in 2009 when he mounted a High Court challenge over Labor’s $42 billion stimulus package, arguing that the $900 payments to individuals exceeded the federal government’s taxation powers. “These greenhouse gases are property owned by the States and it is impermissible for the Commonwealth to impose any tax on any property of any kind belonging to a State,” Mr Pape said. ”The IPA commissioned a legal opinion because state governments have sat on their hands and let the Gillard government introduce a tax that they could potentially stop,” he said. Indeed they have sat on their hands. Premier Barry O’Farrell’s pre-election pledge, and subsequent failure to act, despite publicly affirming to this blogger that he would have the State A-G look into it, is the classic example. ”A copy has being provided to the Premiers and Attorneys-General of the states with the best legal standing for a potential challenge – New South Wales, Queensland and Western Australia,” he said. The legal advice will arrive on the desks of state premiers as they prepare to travel to Canberra this week for Friday’s Council of Australian Governments meeting, where, for the first time in 4½ years in office, Labor will be outnumbered at the negotiating table. Long past time that others joined the fray to pressure State premiers such as Barry O’Farrell and Campbell Newman to make good on their pre-election promises. 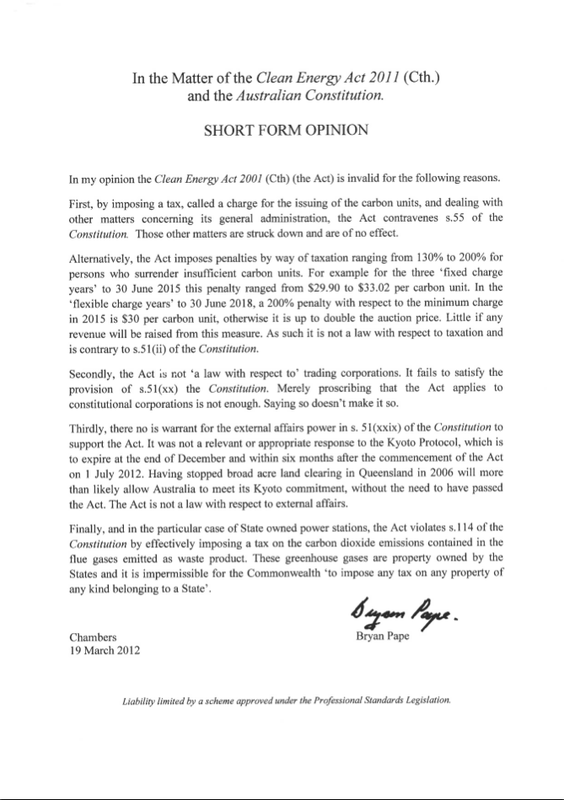 As regular readers know, this blog has been arguing that the carbon tax CO2 derivatives scam is unconstitutional since mid-2011 when the draft legislation was released; reported on Bryan Pape’s expert legal advice on 18 October 2011; reported on constitutional expert Greg Craven’s advice on 21 March 2012, and has been petitioning Liberal State governments to challenge the legislation. Please add your voice to that of this blog, and now, that of the IPA, by writing your State Premier to express Your Will that they honour their pre-election promises. The promises that were key to putting them into power. When it comes to the carbon tax, Mr Pape has a number of back-up arguments aside from his main contention that the Commonwealth can’t tax state property. He also suggests the Commonwealth can’t impose a carbon tax and related penalties within the same piece of legislation nor use the external affairs powers of the constitution.